FORMER president Robert Mugabe’s son-in-law, Simba Chikore, and other top executives at Zimbabwe Airways (ZimAirways) — a new airline whose murky ownership has sparked controversy amid conflict of interest allegations — are pocketing obscene salaries, while their colleagues get peanuts the Zimbabwe Independent can reveal. According to the airline’s salary schedule for the month of April 2018, seen by the Independent, the hefty monthly managerial perks range from US$2 300 and US$117 000. In sharp contrast, the rest of the company’s employees earn an average of US$500, while some are paid measly monthly salaries as low as US$190. A salary schedule seen by the Independent this week shows that Chikore, whose real name is Simba Mutsahuni, is withdrawing salaries and allowances totalling US$117 831 per month, making him the highest earner at the airline. After tax, he takes home US$60 000. Chikore resigned from his position as Air Zimbabwe chief operating officer at the end of October last year to become the ZimAirways CE, although government claims he is a consultant. He has drawn salaries and allowances totalling an estimated US$943 000 in the eight months he has been with the airline. Another senior employee, Crespo Francisco, who is the ZimAirways flight operations manager, earns a net salary of US$15 000 per month. The airline’s manager for quality and safety, Ionica Radicanu, earns a total of US$8 000 per month, while deputy human resources manager Simon Musakasa gets US$3 000 per month. The modest earners are head of legal services Bertha Zakeo and information technology manager Arthur Nahari, who both earn US$2 500 monthly. They are also entitled to additional housing allowances amounting to US$300 and school fees allowances of US$1 000 each, bringing their total monthly earnings to US$3 800. However, other employees do not enjoy those benefits, as indicated by the salary schedule. These extravagant salaries apparently have no justification since the airline is yet to start operations to generate revenues and has yet only incurred massive outlays. It is not clear who is financing the high salaries, particularly Chikore’s rich pickings. Only one of the airline’s four planes government is acquiring from Malaysia in a questionable deal has arrived in the country and has accrued costs exceeding US$100 000 for parking fees, mandatory maintenance and crew hire before it was flown back to the Asian nation where it now risks beind impounded due to unpaid US$1 million maintenance fees. The plane flew to Malaysia on May 25 after government paid US$300 000 to ZimAirways to carry Zanu PF campaign material from China and India ahead of the critical July 30 general elections. 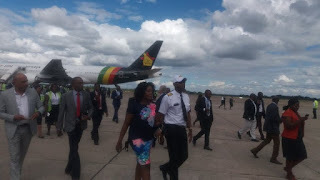 Transport minister Joram Gumbo had convinced government officials that the Boeing 777, acquired for US$18 million amid allegations of corruption, could be chartered to China and India without an air operator’s certificate (AOC). As reported by the Independent two weeks ago, it has now emerged that Boeing, the manufacturer of the wide-bodied B777 jetliner, is demanding US$680 000 to produce manuals for the plane, which government was failing to raise. The high salaries also come against the backdrop of a 2014 government directive which capped salaries for all state enterprise executives at US$6 000.